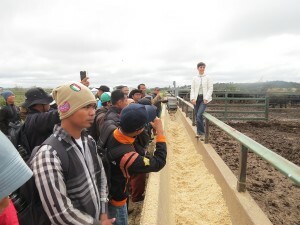 Thirty industry professionals from Indonesia have arrived in Australia for six weeks of intensive training on beef production systems at the University of New England. UNE has developed a short course on Cattle Production and Animal Husbandry affording participants the opportunity to learn from best practices within the Australian beef production sector. The participants will spend four weeks with UNE experts learning about all aspects of beef production, welfare and marketing and tour specialised beef facilities in NSW and Queensland. They will also spend two weeks on the Longreach and Emerald campuses of UNE’s partner, the Queensland Agriculture Training College, where they will acquire hands-on experience in commercial farm and feedlot environments. A key focus of the training is on the innovation process rather than just technical knowledge. According to course leader, Professor John Gibson, the technical knowledge is only of value if it is converted into improved agriculture systems. “UNE specialises in the processes of business development and engagement with stakeholders that drive agriculture improvement both locally and around the world”, said Professor Gibson. “Indonesia is a very diverse country and the training will benefit the large number of poor smallholder farmers who rear beef cattle as well as the larger operators in Indonesia, all of whom are helping Indonesia build a reliable beef supply. On Tuesday 28th April, the Education and Cultural attaché, Professor Ronny Noor, from the Indonesian Embassy will meet with the Indonesian training participants and UNE staff to learn more about their time in Australia. This training is an initiative funded by the Indonesia-Australia Partnership on Food Security in the Red Meat and Cattle Sector under the Australia Awards program.